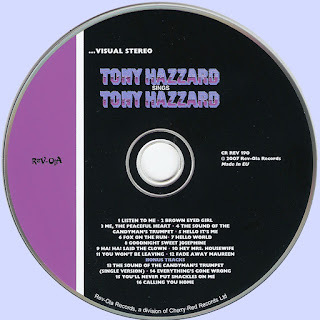 Tony Hazzard graduated from university in the sixties and, by a quirk of fate, went straight into the music business. He began as a solo singer featuring in classic sixties television shows such as Ready Steady Go and Thank Your Lucky Stars, but it soon became clear that his forte was songwriting and, during a three year period, from 1966 to 1969, he wrote six top twenty hits in the UK and Europe for the likes of Manfred Mann (Fox On The Run & Ha Ha Said The Clown), The Hollies (Listen To Me), The Tremeloes (Hello World), Lulu (Me The Peaceful Heart), and Herman's Hermits (You Won't Be Leaving). He also had songs recorded by Gene Pitney (Maria Elena), Dave Berry (Love Has Gone Out Of Your Life), Simon Dupree and The Big Sound (The Eagle Flies Tonight), Nana Mouskouri (Mamma), Cliff Richard (The Sound Of The Candyman's Trumpet), Hall & Oates (The Princess And The Soldier), and The Yardbirds (Fade Away Maureen & Ha Ha Said The Clown), culminating in 1974 with another Top Twenty hit for Andy Williams (I Think I'm Over Getting Over You). During this time he also wrote and produced television jingles, and wrote theme tunes for BBC and ITV series. One jingle won an award at the Cannes Film Festival. He also sidelined as a session singer and guitarist working with the likes of James Last, Long John Baldry, and Elton John, featuring on three of the latter's albums (Elton John, Tumbleweed Connection & Honky Chateau) and appearing on stage with him at his first Royal Festival Hall concert. In 1969 he recorded his first album, mainly a collection of the demos of the hits, entitled “Tony Hazzard sings Tony Hazzard”. A version on CD was released in 2007 by Cherry Red Records. 1971 saw the release of his second album “Loudwater House” followed in 1973 by “Was That Alright, Then?” A double CD of these albums was released on the Sanctuary label in 2005, under the title “Go North – The Bronze Anthology”. During the early seventies he also toured extensively with his band, featuring musicians who had played on the albums. In 1976 he recorded an album, “Hazzard & Barnes” with an old friend, Richard Barnes, who had previously sung harmonies on all the demos of the hits. In 1974 he moved to Cornwall and contemplated leaving the music business, but a visit to Nashville and Los Angeles in the late seventies sparked another creative period during which he wrote many songs which have never been published. In 1977 he won a Citation Of Achievement from BMI, one of the American equivalents of The Performing Right Society in the UK, for one of his sixties hits, Fox On The Run, which, in the intervening years, had traversed the Atlantic and become a bluegrass standard. It has since been recorded by the majority of bluegrass and country artistes, including Tom T. Hall, Bill Monroe, The Country Gentlemen, George Jones, Ricky Skaggs, Flatt & Scruggs, Doc Watson, and Bare Naked Ladies. 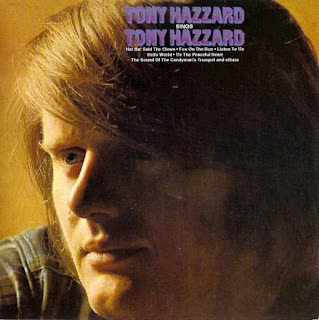 Though he never achieved chart success in his own right, the British songwriter Tony Hazzard penned many hits for Sixties pop groups such as the Hollies and Manfred Mann. This high-quality collection, much sought-after on vinyl, features Hazzard's own versions of his songs, including the Manfred Mann hits "Fox on the Run" and "Ha Ha Said the Clown," with backing by some of the cream of late-1960s U.K. session musicians. Cherry Smash and The (formerly Swinging) Blue Jeans all turned to Hazzard's effortless pop tunes in the late '60s too. In the midst of all this success as a writer, Tony somehow found time to polish up a dozen or so of his demos (themselves things of fully formed wonder as played by the top session cats of the day) and thus was born his first 'solo' LP, Tony Hazzard Sings Tony Hazzard, released in 1969. It features all of the aforementioned mega-hits and a selection of other equally worthy pop gems as rendered by Tony, his band and pals like Jimmy Page and The Hollies' Tony Hicks. This compilation is produced with Tony's full co-operation and features ultra-rare non-LP single sides and brand new, in-depth liner notes by Rev-Ola's very own Andy Morten, this is a must for all lovers of pure '60s pop thrills. 16 tracks. Rev-Ola. 2007.